It took years, but eventually Jymi Bolden persuaded Melvin Grier it was possible to be both a photojournalist and a fine artist. Bolden was a student at the Art Academy of Cincinnati when he worked during the 1980s as a photo intern with the already seasoned Grier at The Cincinnati Post, and that’s when the persuasion began. From Grier, Bolden learned journalistic photography, which he later would put to use as photo editor for CityBeat. And Bolden, director of the non-profit Art Beyond Boundaries gallery in Over the Rhine, is proud to have introduced fine art to Grier’s lexicon. To the benefit of the Greater Cincinnati art scene, Grier has taken that advice. “But we would have this discussion and it got to the point where I decided, ‘It’s OK, you can be an artist, you can be an artist,’” Grier says. “So I started showing my work more, and I think I’ve made the transition to being very comfortable being in the art world also, as long as it makes sense. The witty and contemplative Grier, who retired from journalism in late 2007, the day The Post closed, hails from the old school of photojournalism. He remembers when USA Today changed everything with its extensive use of color photographs. He remembers shooting the same NFL football games with two types of film – color and black & white. He says that now, but listening to Grier’s excitement about his many journalism adventures, there weren’t many days when he would have traded his career for anything else. Through his glasses in a dimly lit Over the Rhine coffee house, his eyes glimmer as he recounts memorable moments one after another, even those when he wasn’t holding a camera in his hands. Like the time, during Super Bowl XVI in 1982, when he and a pilot were taking off in a chartered plane from Michigan with film, so they would make The Post’s deadline…. When he says wonderful, he means it. There were plenty of assignments in his career when Grier was the only African-American in the room, and many area homes he suspects he was the first black person to enter. Grier’s daughter, Samantha Grier, 31, herself became a news photographer, with absolutely no pressure from him to do so, and worked several years for the Journal-News in Hamilton before becoming a freelancer. Grier’s son, Miles, is an English professor and Shakespearean scholar with a doctorate at Queens College in New York. Bolden says Grier’s work has its own style. “Not only did his photos inform you like a journalistic photograph, but they were also provocative – had that quality to make you think, had that quality to incite feeling, and that isn’t necessarily a requirement of journalistic photography,” Bolden says. His work was impressive enough that he twice was named Photographer of the Year- once by the Ohio News Photographers Association and another time by the Cleveland Press Club for medium- and smaller newspapers. 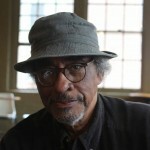 Grier also is a member of the Cincinnati SPJ Journalism Hall of Fame and that of the National Association of Black Journalists’ local chapter. 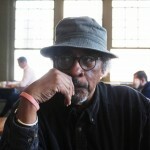 Grier was born in 1941, in Cincinnati’s General Hospital, and raised in a tenement in the West End. A nun at his school suggested he might make a good priest, so he attended the Sacred Heart Seminary. “I was in there for three years,” Grier says. “And then it was suggested, rather strongly, that that was not my vocation. So I finished up at DePorres High School,” in the West End. Around that time, he wanted to be a Jazz drummer, and played gigs around town. He landed a janitorial job with the Shubert Theater. He joined the Air Force in about 1961, and served for four years, including in England, where he picked up his love for photography. “Because I was stationed overseas in England, you could order equipment from Japan at a really, really nice price, but it took forever to come,” Grier says. “So I ordered a camera and a couple of lenses and just started shooting. It wasn’t my job, it was my hobby. But I entered a contest in the military newspaper, Stars and Stripes. Well, I got lucky, and I won a first place and a second place. So that made me feel like maybe I could actually…” do this, for a living. He also remembers having to sit on the floor of a taxi cab on the way to his military base because the white driver could get into hot water being seen driving a black passenger. After returning home, he worked about a year as an assistant to Cincinnati photographer Austin Bewsey before he worked eight years shooting half-tone images for Young & Klein Lithographers. While there, he started Terra, a well-received but financially unsuccessful photography magazine that increased his connections within the local photo world. 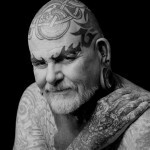 Mimi Fuller was one of the first generation of Post photographers Grier worked with after being hired in 1974. He quickly clicks off names of many great photographers he has shot for The Post, including, most recently, Bruce Crippen and Patrick Reddy, who now works for The Enquirer. While in England with the Air Force, Grier also gained a lifelong appreciation for English gardens and fashion photography, which germinated from his reading of magazines like Queen in libraries. Grier shot his share of fashion with The Post, another fond memory. “Fashion photography was something I loved doing because there was a woman there in the features department, named Mary Linn White, and she wrote the fashion. And we started getting a good working relationship. So I would go up to her desk, and I would say, ‘What are you working on next?’ And she would say, ‘I’m going to work on spring coats.’ So I would start thinking about spring coats, and where we could shoot it, because we didn’t have a budget, and then we would make the arrangements and get the models,” Grier says. 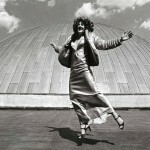 Once, he shot fashion on the roof of Union Terminal. Another time, it was on 4th Street downtown, after he timed the traffic lights to see how much time they would have. That shoot began in the McAlpin’s store downtown, but the store was too busy in the background, so they tried the Skywalk, which also didn’t work. “And I looked down at Fourth Street, and I said, ‘Hey, Mary Lynn: Why don’t we shoot this in the middle of Fourth Street?’ And she had a real sort-of funny laugh. So she laughed, we got a chair, took the model, we went down, I timed the stop light, for how long we were going to have to do it. I walked out with the model, I set the chair down, she sat down, I turned around, shot it before traffic would go through. We went back and did that several times. So that was fun. He shot two Super Bowls, and in a non-newspaper assignment, shot from the Goodyear blimp. He shot the 1990 World Series and more basketball than he would rather recall. It’s nearly impossible to shoot an iconic basketball image, he explains. Today, he’s getting great pleasure from gardening – many of his plants he starts from seeds at his South Avondale home, where he lives with Brenda, his wife of 46 years. He’s currently focusing his lens on Jazz, another love of his life – aside from his family, gardening, photography, and the Cleveland Browns. Grier once even managed to create a sort-of fashion photo from an NFL assignment when he captured the Browns’ Hanford Dixon and Frank Minnifield walking on Cleveland Municipal Stadium’s turf in fur coats before a Bengals’ game. He also shot one of the most heartbreaking series of events in Cleveland history – the game-ending “Drive” by John Elway and the Denver Broncos in the 1987 AFC Championship Game. As the fourth quarter wound down, ““I’m thinking, ‘Oh, man, Cleveland’s going to the Super Bowl!” he says. “Well, yeah,” he says, dolefully, reliving that crushed dream. Something good did result from that, he says: With his shot of Denver kicking the game-winning field goal, “I had the exact same shot that Sports Illustrated used on their cover,” he says. He and that photographer later became friends. A Post reporter once told him he couldn’t go to foreign lands working at the Cincinnati paper. “Why not?” Grier replied. He visited numerous countries for the paper, including Cuba, El Salvador, Eritrea, Kenya, Somalia and Vietnam. “I love looking at photographs. Any kind of way I can see them,” he says. He subscribes to magazines with quality images, including LensWork and Vanity Fair, “because Annie Liebovitz is one of their photographers. And plus, I get to see people live a lifestyle that I don’t have. So I can see how things are in the Hamptons,” he explains. There’s something else Grier does these days, other than exhibiting his work and serving on boards FotoFocus (he’s also a trustee on the Cincinnati Park Board and was on the Robert Duncanson executive committee at the Taft Museum of Art): Grier encourages news photographers to exhibit their work. Grier smiles inside when he realizes that photography – along with his wife’s work – paid for everything in his house, plus fed and educated his now-grown children. 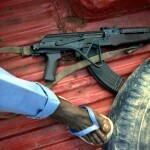 Bodyguard – the foot and weapon of a bodyguard during an assignment in Baidoa, Somalia, for The Cincinnati Post. Photo by Melvin Grier. 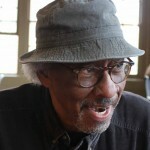 Don – a portrait from Let’s Face It, which exhibited at Kennedy Heights Arts Center. Photo by Melvin Grier. Fashion Atop Union Terminal. Photo by Melvin Grier. 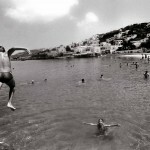 Swimmers – Mykonos, Greece. Photo by Melvin Grier. Grier doesn’t advocate taking selfies, but he is on Facebook, and he cringes at some of the poorly taken self-shots. So much so that he offers this piece of advice to those who must indulge in capturing themselves with their own camera phones.